The perfect one dish meal that is ready to eat in just 30 minutes. This Italian cuisine is perfect for the whole family, including some garden favorites. Boil water and cook tortellini according to packaged instructions. Drain and rinse. Meanwhile, prepare sun dried tomatoes by using food scissors to cut into smaller pieces. Mince garlic cloves and shred mozzarella cheese and put aside. In a large skillet over medium heat, pour 2 tablespoons of olive oil and heat sun dried tomatoes. Add minced garlic and cook for a minute, continuing to stir so that the garlic does not burn. Add fresh spinach and continue cooking and stirring until spinach starts to wilt. Next, pour unsweetened almond milk, salt, and paprika and bring to a boil. Reduce to a simmer and add mozzarella cheese. Stir to melt. Add chopped fresh basil. Add cooked tortellini to the sauce, mix to coat. Warm on medium low heat as needed to combine. Serve with a dash of grated Parmesan cheese on top and some additional raw spinach leaf added to the side. Avoid using pre-packaged shredded cheese if possible. It does not melt as well and contains additives that form a waxy coat over the cheese. This can take your body anywhere between one to three days to digest. Try to shred your cheese from a pound block with a grater. Here is a great recipe on how to make your own homemade tortellini. Crystal Ayres is the founder of Eat Fresh Living and Head Chef of her household. She enjoys eating natural peanut butter with a spoon, eating many fresh greens like a rabbit, and sharing her enthusiasm for food with others. I would love to hear your thoughts when you do. Is that…rumbling I hear in my stomach? Haha! It may possibly me. I do not do much pasta, but when I do, it is always tortellini. This looks so yummy! I would love try making homemade tortellini at home. Thanks for sharing the video! The secret is all in the pasta making machine. I can not imagine having to hand roll it all so perfectly. Vanessa, we do not eat tortellini frequently as well. It makes it a nicer treat when we do finally serve it up to the family. This sounds great. The challenge for me is figuring out if my youngest will eat it as a part of a family meal (she hates most pasta) or if it’s just for mom’s lunch. Stephanie, Understandable. I have done mozzarella chicken dishes similar to this that work just as well. Simply put a breast in the skillet and cook with the spinach, sun dried tomatoes, and other ingredients. When it comes time to add the cheese, grate some mozzarella on top of the chicken and cover for several minutes until it melts over. This recipe sounds delicious and easy to wipe up! Love adding fresh veggies like the spinach. The note about cheese is a great point! ?? Xo, Evelyn PathofPresence ? Evelyn, thank you for your comment. I love when a complete meal can be prepared and cooked all together as well! I love the sound of this recipe. It sounds very tasty. Will try it. Thank you for your feedback. I would love to hear how it turns out for you. Fatima, What a coincidence. I hope you enjoy the meal! Ok!!! I need to try this. I watched you how to make tortellini’s. Making my own pasta is on my bucket list. We eat a lot of pasta and I would love to make my own. Now I don’t have the machine to roll it out so I would have to use a rolling pin. Lol, but the real chefs call that rustic, right? Rose, You can definitely build some strength in your arms and wrists rolling the dough out yourself. Rustic is in style! O wow. I wish I can attempt to make this but I am so not there yet. This looks delicious by the way! Thank you for stopping by. Take a look around at http://migration.eatfreshliving.com/category/recipes/ to see some other recipes available that may be a better fit. Melanie, the mozzarella topping makes it the perfect combo. 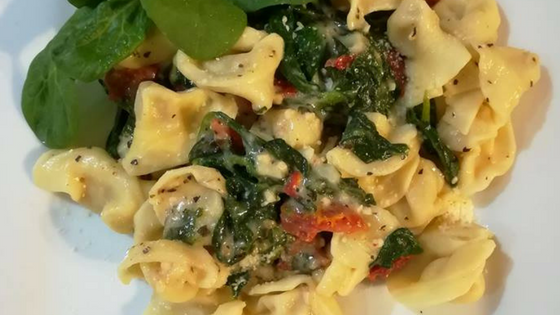 I love my cheese so much, I made sure the tortellini noodles were spinach and cheese too! I don’t think I’ve ever tried Tortellini pasta before, but it looks so good! Seems like a great healthy lunch option. It is great for on the go. Cook ahead of time and store in some small round corningware dishes for lunch the next day. I would pair with a nice spinach salad and an apple. Oh this looks absolutely delicious! I also love that it can be prepared so quickly get is genuinely tasty. Thank you so much. It makes it a great choice to eat as a weeknight meal. I love the idea of tortellini and mozzarella. Now I want to add this recipe for the weekend. Fatima, I hope you had a chance to try out the recipe this past weekend and found it to be pleasing to your taste buds.